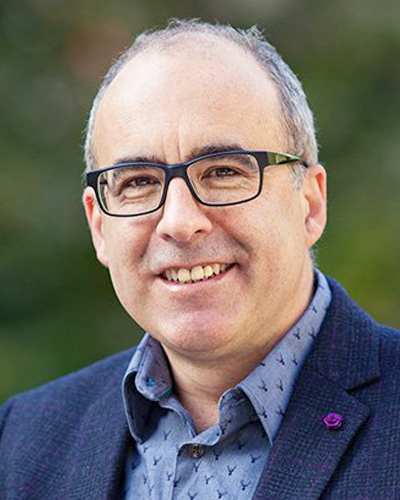 Co-Programme Lead and Head of the Department of Biochemistry, Professor Gerard Evan, is amongst 22 internationally-renowned scientists in the field of cancer research to be elected Fellows of the American Association for Cancer Research (AACR) in 2019. Election and induction into the AACR Academy is restricted to individuals whose work has had a significant and enduring impact on the cancer research field. 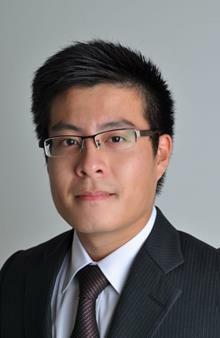 Gerard's Fellowship recognises his work in "elucidating the molecular dichotomy of the Myc protein as an inducer of both cell proliferation and cell death, and for generating inducible mouse models capable of recapitulating genetic insults commonly observed in cancer." The AACR Academy will formally induct its 2019 class of Fellows at the AACR Annual Meeting 2019, held in Atlanta. The mission of the AACR Academy is to recognise and honour distinguished scientists whose scientific contributions have propelled significant innovation and progress against cancer. The Fellows of the AACR Academy serve as a global brain trust, helping to advance the mission of the AACR to prevent and cure all cancers through research, education, communication, collaboration, science policy and advocacy, and funding for cancer research. Fondation ARC is the largest French foundation dedicated entirely to cancer research, and is funded by public donations. Their mission is to support research in the fight to eradicate cancers, with an ambitious goal to "cure 2 cancers out of 3 by 2025". The Foundation's Léopold Griffuel Award is a prestigious European cancer research prize that has been awarded annually since 1970. Award winners are scientists and physicians who have made an important contribution to better understand, diagnose, cure and prevent cancers. The award was created according to the will of the late Mrs Griffuel by bequest, in honour and memory of her late husband, Mr Léopold Griffuel. In Basic Research: Professor Laurence Zitvogel (UMR Inserm) for her research in immunology, which improved the understanding of the biological mechanisms of the anti-cancer immune response and immunotherapies. Her discoveries have changed the way the immune system is understood in relation to cancer treatment. 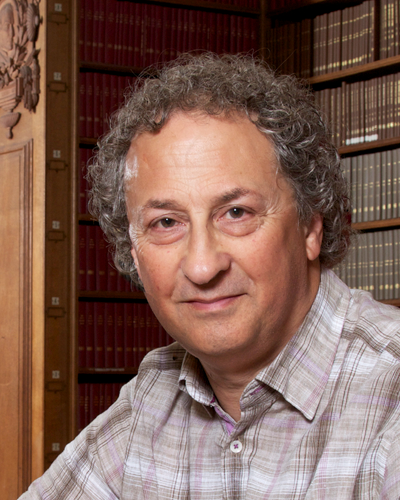 In Translational and Clinical Research: Professor Steve Jackson (Wellcome/Cancer Research UK Gurdon Institute, Department of Biochemistry) for his work on DNA damage repair and his role in the development of medicines such as PARP1 and 2 inhibitors, currently used for cancer treatment. Professor Jackson said "I am deeply honoured and delighted to be given this prestigious award for my research, which has been translated into patient benefit. 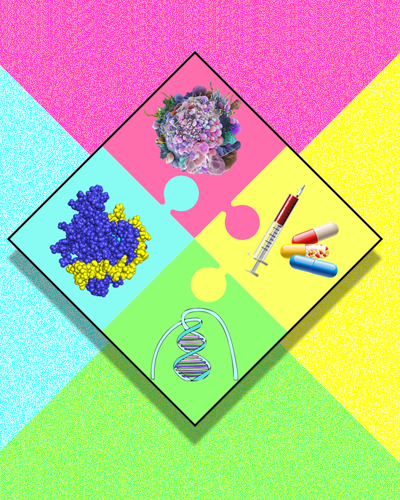 The field of DNA damage repair has expanded substantially in recent years and continues to provide us with new avenues for understanding the causes of cancer, and identifying new therapeutic targets." The Fondation ARC also announced that an award ceremony will take place in honour of the laureates on 10th April 2019 at the Salon de l'hôtel des Arts et Métiers in Paris, France. Congratulations to Professor Julie Ahringer from our Programme on becoming the first female Director of the Wellcome Trust Gurdon Institute! 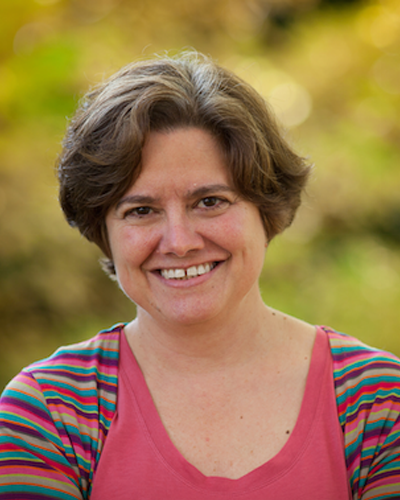 Julie, a Group Leader at the Gurdon Institute for over 20 years, succeeds Professor Daniel St Johnston (also a member of our Programme) who has served as the Gurdon Institute Director since 2009. You can read about Julie's research into the regulation of chromatin architecture and function on the Gurdon Institute website. Congratulations also to Professor Eric Miska from our Programme who has been appointed as the new Gurdon Institute Deputy Director. On the 19th of November, the UK-Israel and the Dotan Center International Symposium 'Advances in Research of Haematological Malignancies' was held at the Felsenstein Medical Research Center on the Rabin-Schneider Medical Campus in Israel. There were four sessions throughout the day focusing on the latest research in the field, which included Programme member Dr KJ Patel, from the MRC Laboratory of Molecular Biology, presenting research on why bone marrow fails in Fanconi anemia. Further lectures were given by members of the Haematological Malignancies Programme, Professor Bertie Gottgens and co-programme lead Professor Brian Huntly, with the Plenary Lecture delivered by co-programme lead Professor Tony Green. The symposium attendees are pictured with Mr David Quarrey, British Ambassador to Israel (centre). Presented by the Cambridge Film Trust and now in its 38th year, the Cambridge Film Festival celebrates cinematography, past, present and future, to relive previous glories, share what’s happening in film today, and reveal the upcoming talents that will shape the future of cinema. In partnership with Cambridge Assessment, the Family Film Festival strand at the Arts Picturehouse delivers films in a friendly environment to give families plenty of opportunities to get involved in the Festival. On Sunday 28th October, our Programme and the Department of Biochemistry joined the Family Film Festival for their family-themed short films with hands-on activities based around DNA; the molecule of inheritance. 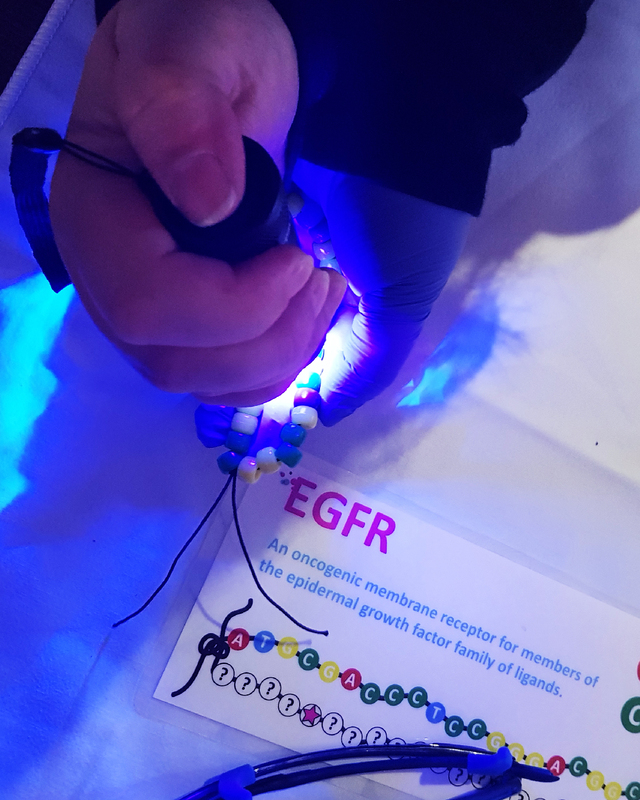 Throughout the morning, young film lovers took on the role of a scientist to extract DNA from strawberries, learn about genes, and create their own mutatable double-stranded DNA bracelets to find out how mutations can lead to cancer. We would like to thank the Festival organisers for giving us the opportunity to take part in an extremely enjoyable day, our volunteers for making our activities possible, and everyone who came out to visit us! 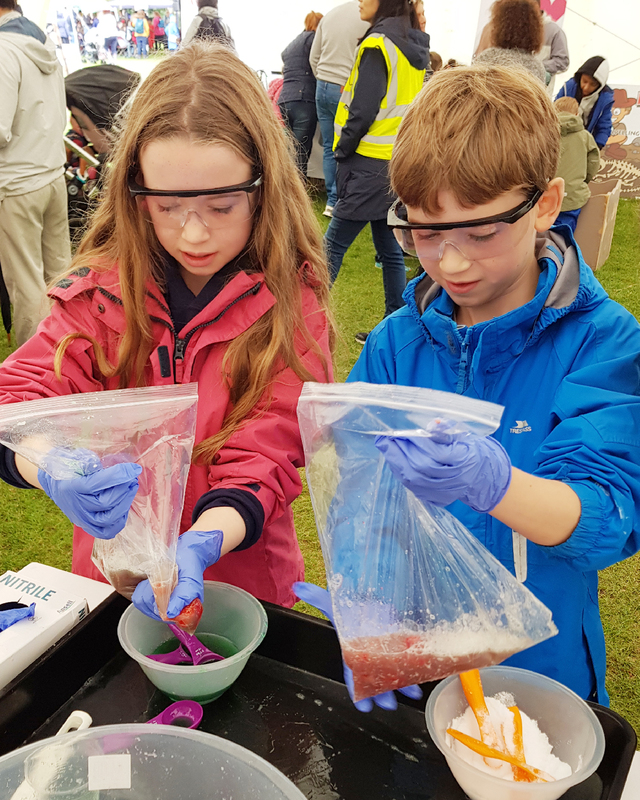 On Saturday 22nd September, in collaboration with the Department of Biochemistry, our Programme ran two activities for the Cherry Hinton Festival in Cambridge; a DNA extraction from strawberries and a crafts activity to produce double-stranded DNA bracelets. Through these, our aim was to introduce Festival goers to the fundamentals of DNA biology, from the base pairing rules of A-T and C-G to the roles of mutations, tumour suppressor proteins and oncogenes in cancer. "This is dead cool!" said a highly enthusiastic future scientist on watching DNA precipitate following addition of alcohol to the extraction solution, whilst a parent commented that it's "great that CRUK expose children to science at a young age", adding that they were "amazed" at how much DNA we have inside each of our cells (around 2 meters). The Festival Day was an extremely enjoyable occasion and a fantastic success, despite the wind and rain, with around 4,000 people from all age groups attending and over 900 guests taking part in our activities. We would like to thank the organisers for inviting us to exhibit, our volunteers for their hard work, and also everyone who visited our stalls to learn about DNA and take part in some fun(damental) science! It may have been one of the hottest summers on record, but my summer remained cool (and at times < -150 °C) whilst I carried out a research project in the air-conditioned and well-equipped MRC Laboratory of Molecular Biology in Cambridge. Alongside my supervisor, Dr Juan Rodríguez, a postdoc in Dr Lori Passmore's lab, I joined their investigation into the function and interactions made by a very important protein complex, the Cleavage and Polyadenylation Factor (CPF). CPF modifies RNA, an intermediate molecule during the decoding of DNA to protein, by adding a string of adenosines (A) forming a poly(A) tail. Before adding the tail, CPF cleaves RNA, hence the cleavage part of CPF. During my project, I focused on the components of CPF involved in cleaving RNA and how they might be regulated. My experiments allowed me to use a variety of genetic, biochemical and structural biology techniques from flash-freezing cells in liquid nitrogen, protein purification to growing protein crystals, and preparing libraries for next-generation sequencing. All in all, I had a great summer and am very grateful to the MRC for funding the project and to the lab, for providing the perfect blend of mentoring and entertainment. I have gained much more lab confidence and am now excited to further pursue my career in scientific research! Eleanor is an undergraduate student reading Natural Sciences at the University of Cambridge. She is about to begin her fourth year, which includes a research project in the laboratory of Professor Jussi Taipale in the Department of Biochemistry. Last week, Dr Rhys Grant from our Programme collaborated with Dr Sio Ball and Dr Rita Monson from the Department of Biochemistry to run a summer project for students taking part in the Clifton Scientific Trust's UK-Japan Young Scientists Workshop. The project, Bacterial Phenotypes in the Local Environment, saw A-level students from the UK and Japan working together to characterise bacteria isolated from the Downing Site in the centre of Cambridge. 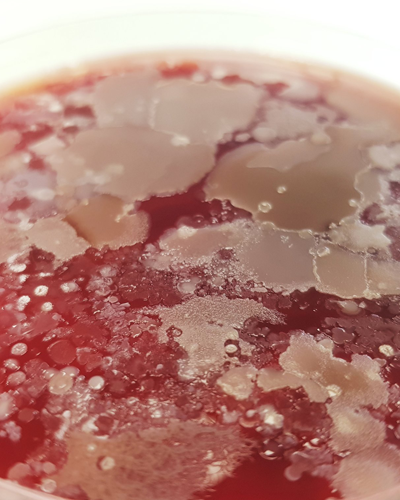 Students first had to find their bacteria, taking swabs from anywhere and everywhere outside the Department of Biochemistry, which were then cultured overnight across a range of media to ensure growth and a variety of traits for analysis. The following morning, once the students had been thoroughly disgusted at the sight of the samples grown, particularly by those which came from the River Cam (pictured), the bacteria were assayed for innate antibiotic resistance, antibiotic production, and quorum sensing (the process through which bacteria 'talk' to one another). Additionally, a selection of the colonies were analysed by gram staining and microscopy to differentiate samples based on the chemical and physical properties of their cell walls. The students worked extremely hard and, as a class, over 1,000 data points were obtained after just 2.5 days in the lab! To end their week in Cambridge, the students presented their results to their peers, project facilitators, scientists, and a number of distinguished guests including the President of Barclays Bank Japan, the Chief Executive of the Great Britain Sasakawa Foundation, and a former Director of the Royal Greenwich Observatory, at the Workshop Presentation Day at Murray Edwards College. The students did exceptionally well throughout the week; learning to communicate across language and cultural barriers, picking up second year undergraduate-level scientific knowledge and practical skills almost instantaneously, and delivering a presentation with the clarity and confidence of professionals. We hope this is the beginning of some fantastic future careers in science for these students and wish them all the best for their future studies! Cancer is the second leading cause of death in the UK, and as such requires our best efforts to develop the most effective treatments. 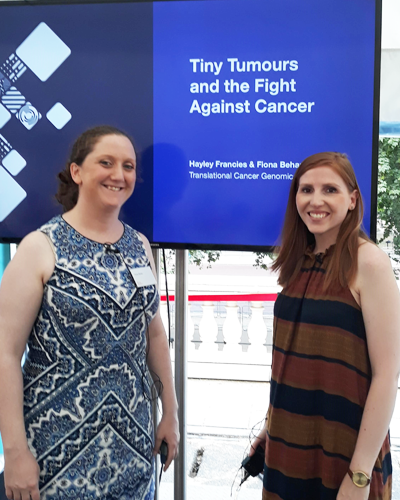 At the recent Royal Society Summer Science Exhibition, Dr Fiona Behan and Dr Hayley Francies presented research from the Sanger Institute describing efforts to identify new cancer drug targets. Organoid technology allows us to grow cancer cells in 3D, capturing many features of cancer. This ability of organoids to mimic cancer has led us to use them extensively to model drug responses. We combine these 3D models with CRISPR-Cas9 genome-editing technology to identify genes essential for the survival of cancer cells. By switching off each gene in the cancer cell and identifying those required for survival, we identify new candidate drug targets that could be brought to the clinic. Through combining these advanced technologies, we hope to contribute to the effort to ensure that every cancer patient receives a successful therapy. 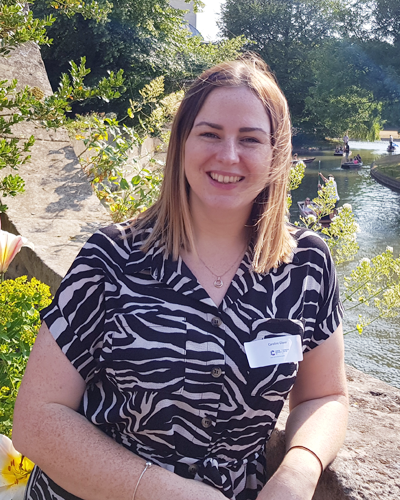 Caroline initially trained as a Chemist at the University of Sheffield, where she completed her Master’s degree, followed by a PhD in Chemistry and Tissue Engineering. She joins us from Cancer Research UK, where she was working as a Clinical Research Funding Manager. Caroline’s role as Programme Manager will involve the monitoring of programme objectives against milestones, co-ordination of resources, meeting management and support to Programme Leads, and directly working with the CRUK Cambridge Centre administrative office in meeting the strategic goals of the Centre. 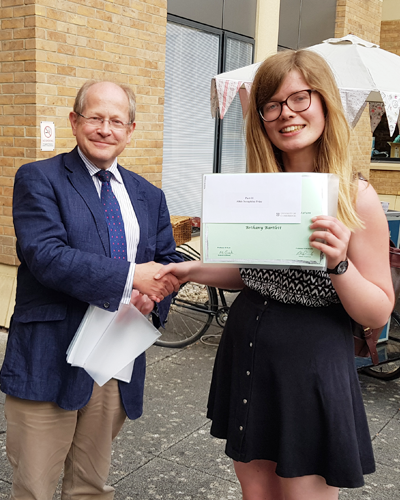 Congratulations to Beth Bartlett on winning the Department of Biochemistry’s Alkis Seraphim Prize for the best third year undergraduate research project, which she undertook in Professor Steve Jackson’s Group at the Wellcome Trust/Cancer Research UK Gurdon Institute. It is highly important for our cells to be able to repair their DNA when it is damaged as defects or mutations in DNA can cause cancer. 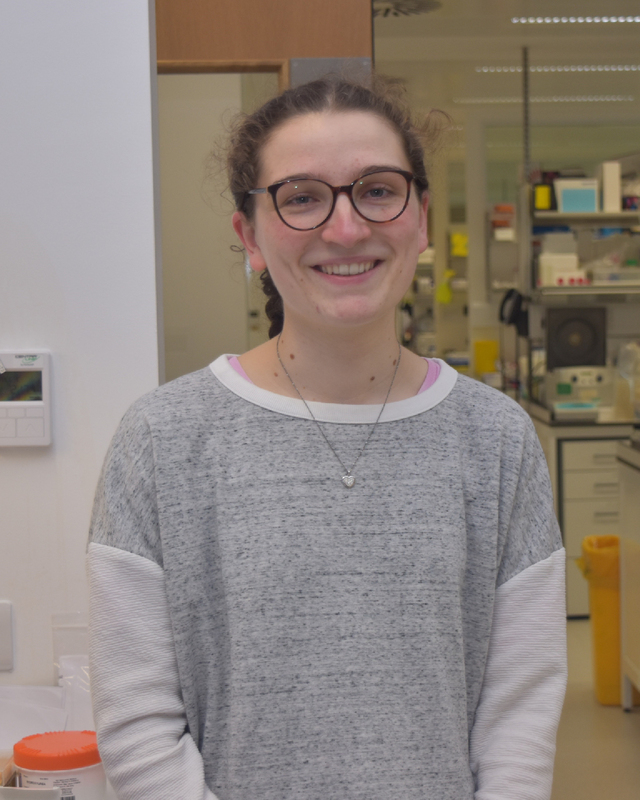 Our cells have several pathways they can use to repair different kinds of DNA damage, with Beth’s project focusing on the Ku80 protein that is involved in repair of DNA double strand breaks. The Jackson Group have previously used CRISPR-Cas9 gene-editing technology to screen for genes that potentially interact with Ku80. One of these genes of interest was Ube2m. Beth’s research found that mouse embryonic stem cells lacking Ku80 are more susceptible to DNA damage, and that cells in which both Ku80 and Ube2m are knocked out are less viable and cannot progress through the cell cycle, suggesting an important role for Ube2m alongside Ku80. 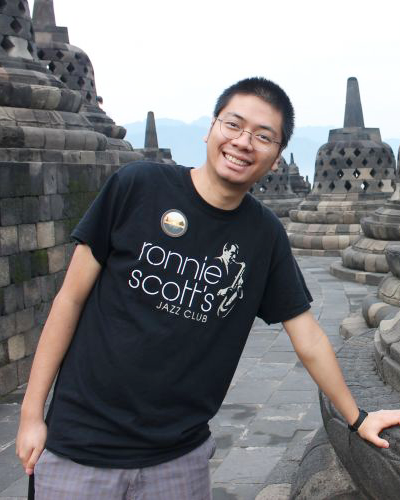 Aji Jatikusumo, a PhD student from Dr Luca Pellegrini’s Group in our Programme and based at the Department of Biochemistry, was interviewed by Gates Cambridge last week on his journey to Cambridge and his research into the process of DNA synthesis. Follow the link below to read the full article on the Gates Cambridge website. 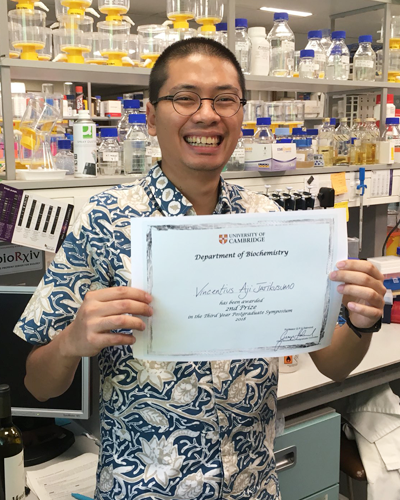 Congratulations to Aji Jatikusumo, a PhD student in Dr Luca Pellegrini’s Group, on winning second prize in the Department of Biochemistry’s annual 3rd Year Postgraduate Symposium. DNA replication is an essential process in all walks of life for passing down genetic information from mother to daughter cells. This process needs to be tightly regulated and efficient as any problems may result in detrimental genetic instability. Our cells have evolved a complex protein machinery to carry out the process of DNA replication. Aji’s PhD research focuses particularly on the initiation stage of the process, where molecular details are currently sketchy. Aji is approaching these outstanding questions by reconstituting the proteins responsible for initiation in vitro, which then can be used for a series of biochemical, biophysical, and structural studies. 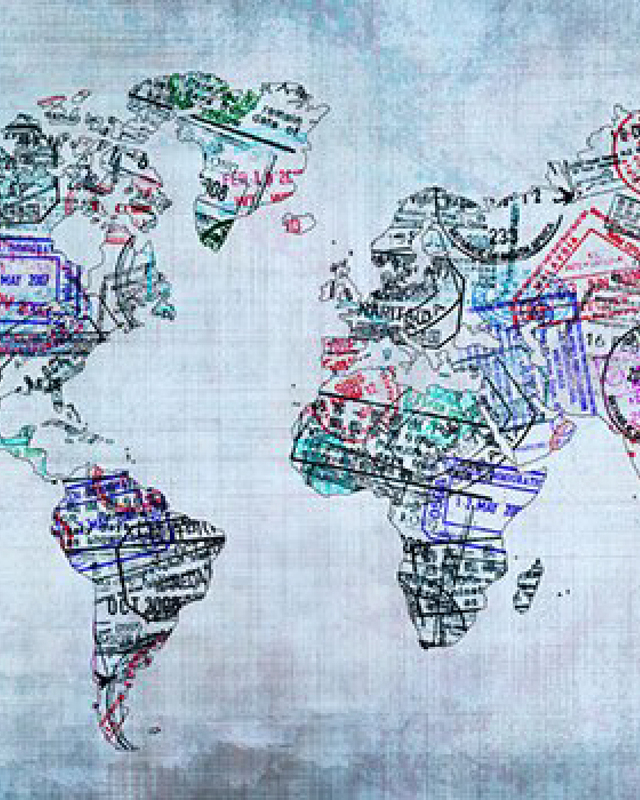 Dr Lori Passmore from the MRC Laboratory of Molecular Biology was interviewed by the BMJ last week about the importance of international mobility in science. Since starting her lab in 2009, Lori has had 17 PhD students and postdoctoral researchers: three from the UK, seven from the EU, and seven from non-EU countries. Her laboratory is very international, and that is the norm in research. Lori commented that "Only with international mobility will we be able to attract and retain outstanding scientists, and maintain our strong position as global leaders in science." 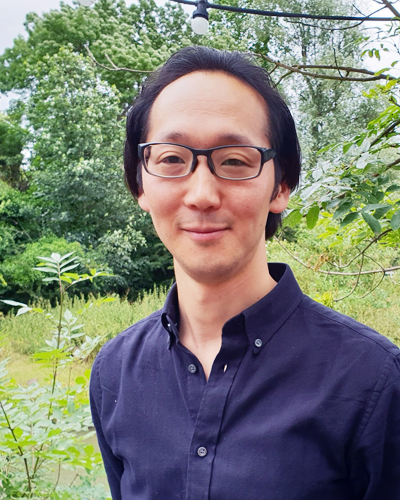 Dr Yuu Kimata, a Group Leader from our Programme based at the Department of Genetics, is sadly leaving Cambridge to begin a new research group as an assistant professor at the ShanghaiTech University, China. We would like to wish Dr Kimata every success for the future! 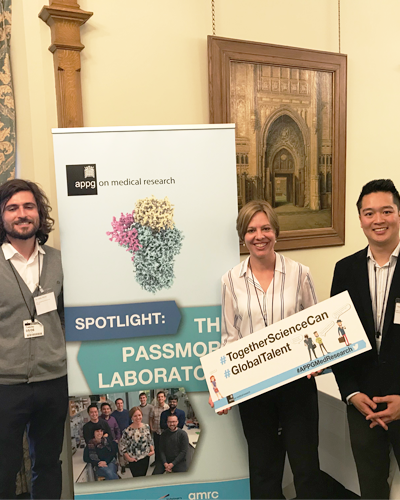 A number of Cambridge researchers attended a meeting of the All Party Parliamentary Group on Medical Research at the House of Commons on 5 June. The aim of the event was to discuss the importance of international mobility in science. Dr Lori Passmore, from the MRC Laboratory of Molecular Biology, gave a keynote talk focussing on international diversity in her team, and the importance of mobility for attending conferences, accessing scientific infrastructure and working with collaborators. Since she started her lab in 2009, 17 PhD students and post-docs have worked with her – 3 from the UK, 7 from other EU countries and 7 from non-EU countries. Dr Pablo Alcón and Terence Tang from Lori’s Group were also there to discuss issues around mobility with parliamentarians. Overall, the meeting conveyed the importance of an efficient immigration system for skilled researchers and their families, that is fair and transparent. Small G proteins in disease: challenges and progress. The meeting planning is going from strength to strength and the full programme is of extraordinary quality. The programme has just been released and is available via the tinyurl link above. We look forward to seeing as many of you as possible in July! 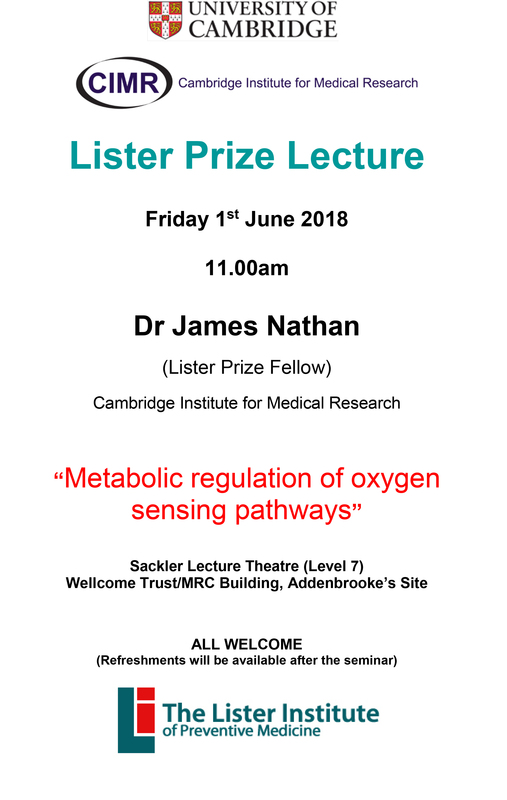 Dr James Nathan from the Cancer Institute for Medical Research will be giving a talk for the award of his Lister Prize on Friday 1st June, entitled "Metabolic Regulation of Oxygen Sensing Pathways". All CMB Programme members are welcome to attend. The talk will take place at 11am in the Sackler Lecture Theatre of the Wellcome Trust/MRC Building on the Addenbrooke's Site. The Lister Prize Fellowships are awarded by the Lister Institute of Preventive Medicine to young researchers undertaking high quality biomedical research, and are designed to assist scientists in situations where the prize money will have a significant beneficial impact on their work and career. 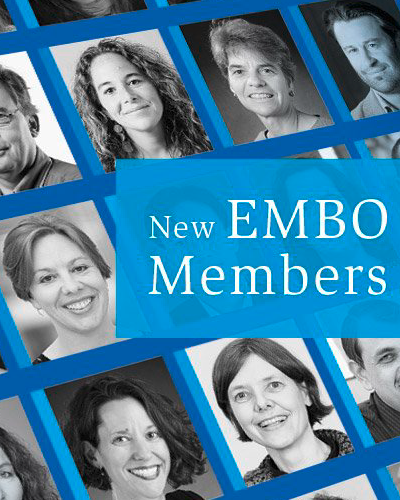 Congratulations to Dr Lori Passmore from the MRC Laboratory of Molecular Biology and to Dr Michaela Frye from the Department of Genetics at the University of Cambridge on being elected as members of the European Molecular Biology Organization (EMBO). Dr Rhys Grant trained as a Biochemist at the University of Cambridge, completing his Bachelor's and Master's degrees in Natural Sciences (Biochemistry), followed by a PhD in the Department of Genetics and a short postdoctoral position in Dr Catherine Lindon's Group in the Department of Pharmacology. Since a young age, Rhys has actively sought out all opportunities related to science communication; ranging from exhibiting at local and national science festivals and blog writing, to the design of educational resources and lecturing at school science clubs. Rhys has joined us from the Linnean Society of London, where he was working as the Education and Public Engagement Manager, to run our Programme's external communications, produce educational digital media, and lead our outreach work. His role is a joint position shared between our Programme and the Department of Biochemistry at the University of Cambridge.